Grand Mosque Ez Zitouna, founded in 732 a.d.
A year ago, or nearly so, if we begin the changes sweeping the Arab World with the immolation of Mohammed Bouazizi – as good a starting point as any – this region was on the verge of sweeping changes. To date, the changes have come in two waves, a wave of demonstrations followed by an election wave. The election wave took some, but not all, of the political energy out of the demonstrations. The former was radical, if not `revolutionary’; the latter, in all cases so far more conservative. Yet the election wave gains it legitimacy from, and claims to carry on the values of, those in the streets who with their hands bare, tore down the corrupt and repressive political house Zine el Abidine Ben Ali built for a quarter of a century. They literally blow his house down…and then trashed it to boot. Ironically those who initiated the first wave have been more or less isolated from the second one. During the second round, in country after country, the Islamic parties showed their strength and to one degree or another came to power. The shift has been pervasive. Tunisia, Egypt, Libya, Morocco…and I dare say if there are elections elsewhere in the Arab world the results will be similar with Islamic parties emerging as the most powerful political force everywhere. In the United States and Europe, there has been some `surprise’ at this electoral turn of events although all the indications are that after all the moaning and groaning in Washington about the Islamic fundamentalist threat, that the Obama Administration is willing to make its peace with `political Islam’ and at least give it a chance. Not that the Americans or the Europeans have any choice. The Arab peoples didn’t ask Washington permission to revolt as I recall. Still, given recent history it is a curious alliance, both for the Arabs and the Americans. Some people ask how did this happen? What happened to these mostly secular radicalized youth for whom religion did not seem to play a role (and didn’t). How is that Tunisia’s militant youth in jeans, carrying cell phones to which they are addicted, those whose courage and militancy brought down the dictator are now being replaced in the public eye by politicians in three piece suits talking about free market capitalism, the Koran and making silly statements about how unwed moms are ruining the country? The long term explanation for the shift goes like this: Tunisia has always been – or at least since around 700 a.d.- an overwhelmingly Moslem country. In Tunisia, despite the fact that yes, there are some Jews and Christians, the country is overwhelmingly Sunni Moslem. Religion in the cultural glue; its diversity is found in language, be it French, Imazighan (Berber). This situation, which extends to other North African countries, differs from the Arab East where it is the Arabic language that gives a connection to peoples that have long been more religiously diverse. In North Africa thus, separating Islam from politics or culture is not possible. Why the surprise then, that Tunisian political institutions shouldn’t on some fundamental level be so influenced? There is also the forgotten (but not here in Tunisia) fact that European colonialism’s assault on the region, from the outset after the Napoleonic invasion of Egypt, has always included a strong Christian proselytizing element which denigrated Islam, sometimes more aggressively, as in Algeria, sometimes with a somewhat lighter touch as here in Tunisia. 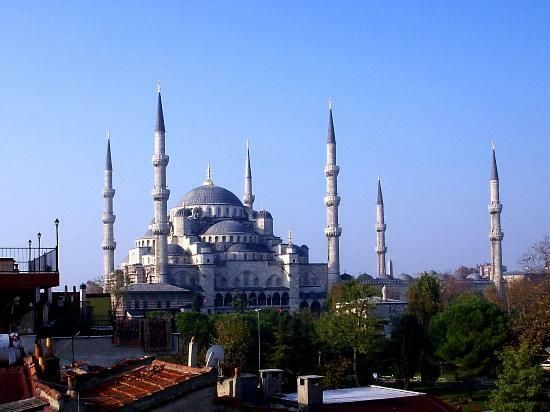 Tunisia has two Islamic institutions of great importance. The holy city of Kairoaun, third most important place in the Sunni Moslem world after Mecca and Jerusalem and Ez Zitouna University, which claims to be the oldest teaching establishment in the Arabic speaking world. Older than the Sorbonne, Oxford, Cambridge, Heidelberg by hundreds of years, founded in 737 Ez Zitouna has been in continuous existence since then. It is true that Tunisia’s first president, Habib Bourguiba, insisted on separating church (or mosque) from state. But he never was so foolish as to challenge the fundamental Islamic nature of Tunisian society. He just tried to modernize it. His biggest contribution, acknowledged by many Tunisians even today was a modern secular education system based more or less upon a French model. In those early Bourguiba budgets a full 50% of the funds were earmarked for education. Furthermore, it wasn’t as if Tunisian Islam at the advent of independence resembled the much more conservative Saudi wahhabist model. Even then it was a much more tolerant, flexible variety which really didn’t conflict very much with Bourguiba’s educational reforms. In response to colonialism, there has been a long struggle of defense of Islam. It has been an integral part of virtually all the North African anti-colonial struggles; the Islamic religion has been written into all the constitutions, although how so, in different ways. Add to this picture the failure of Western secular political models to deliver on the twin promises of modernism: more democracy and more development, and perhaps one can better understand the drift towards `Islamic politics’ in North Africa and throughout the region. If communism has collapsed unceremoniously, and what we might call bourgeois democracy comes to North Africa in the faces of Mubarek and Ben Ali, why not go back to the tried and true religion which has, at least, offered solace these past decades to get through hard times. On a more immediate level, writing in Le Monde on December 78, 2011, Alan Frachon does a good job explaining the political shift in the Middle East towards political Islam, that rings true here in Tunisia. Sitting here in Amilcar, just outside of Tunis, now ten days into a three week stay in Tunisia, I’ve been thinking about that too. Frachon cites four themes to help explain the rise of the Islamic parties. They are worth probing, although I also have some observations of my own to add to the overall picture. First, while none of them initiated the demonstrations in their countries that they were the best organized forces and thus were able to take advantage of the political vacuum created by the departure of tyrants like Mubarak and Ben Ali. It is a sad fact that those who made the revolutions – mostly disenfranchised youth – in all these countries were essentially excluded from power across the board when the elections took place, although they remain active in the social movements which if anything are as critical now to democracy as they were before the regime change. This is not unique. There are many examples where those who make the revolutions do not come to power (whether France in 1789, Russia 1917, Eastern Europe 1989 or now the Arab World 2011). It appears to be more of a rule than an exception. The Middle East parties who have been able to take advantage of this situation are by no means radical. While their rhetoric might talk of ‘continuing’ or `deepening’ the revolution, these parties tend to be rather conservative in the main. Do not expect them to tamper too much with neo-liberal capitalism nor to dismantle the state security apparatus they inherited. This theme certainly reflects what I have been experiencing in Tunisia where Ennahdha, the Islamic Party came out the clear winner by a long shot. It also reflects the situation in Egypt and Morocco where elections yielded similar results. The second point that Frachon makes is that these results could have easily been predicted, and some cases actually were. He cites a University of Maryland survey taken in five Middle Eastern countries –Lebanon, Egypt, Jordan, Morocco and the Arab Emirates asking respondents to name the most admired foreign power in the world today. The answer came back overwhelmingly – Turkey, this despite knowing that there is repression against dissident voices is commonplace there as are terrorist bombings (atteintes). No question – Turkey is the model: limited democracy, a capitalist economy, the separation of church and state, and in the Turkish case, a military ready to step in `if necessary’. It is not only Arab countries that are counting on Turkey but the United States as well, as Turkey’s security role in the region under the NATO umbrella is continually expanded. Thirdly, secularism in the Arab world has a bad name. It is associated with the oppressive regimes, Ben Ali or Mubarek and marks nothing short of an ideological failure of that model. People in the United States, Canada and Europe might associate secularism with democracy, but in the Arab World it was integrally linked with the oppressive system put in place by the dictators. Propping up these dictators, singing democracy’s song while supporting some of the most repressive regimes in the world, has long been the modis vivendi for the United States, France, UK and Italy. As any kind of oppositional organizing or criticism was crushed, it wasn’t possible for secular opposition parties to get any kind of a serious foothold or popular base. In reaction to the abuses of the secular dictatorship, Tunisians found refuge in the mosque and attendance began to grow along with the repression. Islamicists were oppressed too, indeed in Tunisia Ben Ali had nothing short of an obsession with them. But Ben Ali couldn’t destroy the mosques as the Islamic religion runs too deep in the country. It has long been a tolerant, flexible variety of Islam in tandem with the cosmopolitan Tunisian people, descendants of the Phoenicians. Although ripples of fundamentalism have appeared recently (more on that later), Tunisia, unlike a place like Yemen, has never been a Salafist stronghold, to the contrary. Under Ben Ali, with no other place to turn, no social space where they could feel at home and protected, people flocked to the mosques, creating the social basis for the Islamicist political party rise, as well as a wellspring of sympathy for what in Tunisia it had suffered. Deprived of dignity in a civil society that denigrated and oppressed them daily, the only thing left for many Tunisians to retain a small modicum of dignity was their religion. They grabbed hold. Frachon’s fourth point is very simple and accurate: once this wave of demonstrations began there was no way for the United States to stop them. What was Washington going to do, bomb the Tunisian people with F-16s or send in the marines to counter the massive demonstrations there? Not only was the United States caught off guard by the amplitude of the demonstrations, but it really didn’t know how to respond in a way that would protect U.S. strategic interests, especially oil, once they began. 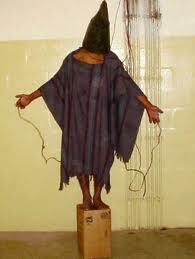 Iraqi prisoner being humiliated and tortured at Abu Ghraib, Iraq. Another thing that came into play that Frachon neglected to mention has been the impact of satellite tv. Channels like Al Jazeera brought the war in Iraq, the Israeli invasion of Lebanon and its military plundering of Gaza onto tv screens throughout the Arab world (and beyond). Of course Tunisians didn’t need Al Jazeera to know what has been going on in Iraq and in Palestine (Israeli Occupied Territories), but it did remove any lingering filters. They have long known both situations, but the power of the images seen on television only brought home to them even more the unfolding horrors. Al Jazeera did not hold back on showing the results of those wars. This not only increased anti-Americanism in the region – already it had a long history actually – every time that the United States vetoed a resolution critical of Israel in the UN, but it cemented forever in the minds of Arabs the U.S.- Israeli connection. The same goes for the U.S. war on terrorism, which despite denials is essentially an anti-Islamic crusade attacking both Arabs and Muslims. Americans might have forgotten about Obama’s pledge to shut down the prison in Guantanamo, but I can assure that Tunisians have not; many have asked about it. I have also been asked by a number of Tunisians how the tortures committed at Abu Ghraib in Iraq can square with U.S. stated concerns about human and civil rights. Hard one to answer…at least truthfully. Humiliated at home by Ben Ali and internationally by the United States, Tunisians turned to their last refuge, the mosques and not surprisingly to the more religious oriented political parties. It will take more than a few good speeches by Obama in Ankara and Cairo to change that. The Amilcar Notes 2 Tunisia: Emerging Democracy or Just Frills? The Amilcar Notes 5 The US-Tunisian Experiment: New Directions In US Middle East Foreign Policy?